(Racine, Wis. – Racine Journal Times) - James DeHahn has trouble sleeping. While his problem is not uncommon, the reasoning behind it is. DeHahn, 44, of Mount Pleasant, was exposed nearly 20 years ago to taunting Iraqi prisoners and to chemical toxins while in Kuwait and Saudi Arabia during the Gulf War. Now he suffers from Persian Gulf Syndrome. "I don't fall into a deep sleep," DeHahn said. "I'm constantly up. I'm always aware of my environment." DeHahn was in the Middle East with the Army National Guard for about five months from February to June 1991 during the Gulf War, which lasted from mid-January 1991 to Feb. 28, 1991. 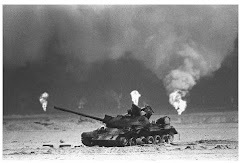 Though those are the war's official dates, American troops were involved in missions as early as Aug. 8, 1990, six days after Iraq invaded Kuwait over oil disputes. Nearly 20 years since that initial invasion and his deployment to the Middle East, DeHahn looked back at his time there and the complications he has had since then. DeHahn enlisted in the National Guard to get money for college. He didn't expect to have to fight, but when the Gulf War started, he was activated and sent to Kuwait. There, he was a non-commissioned officer in charge of Iraqi prisoners of war. DeHahn spent his first few days rounding up Iraqi POWs from collection points in Kuwait before taking them to a large POW camp in Saudi Arabia where he spent the rest of his time as a guard. "We shipped back to our main (POW) camp in the middle of the desert in nowheresville and worked the prisoners of war camp for the next three months before the Saudi Arabians took over," DeHahn explained. "All I had to do was make sure they didn't escape." DeHahn said no one really tried to escape but that prisoners did riot a bit about what he calls "horrid" conditions where the Iraqi prisoners slept in the freezing cold and were kept in by razor wire. The prisoners would taunt U.S. soldiers and throw rocks at them during the day. But things quieted down at night. "We kept them calm at night by giving them cigarettes over the wire," DeHahn said. During the time DeHahn was stationed in the Middle East, he saw plenty of terrible and interesting things, but one stands out most in his mind. "(The Americans) were blowing up ammo bunkers to leave the Iraqis with no ammunitions ... and an unexplainable cloud that covered 100 square miles popped up instead of the typical explosion," DeHahn remembered. Six years later he found out what the cloud was. "I got these letters saying sarin gas and they put me on disability." 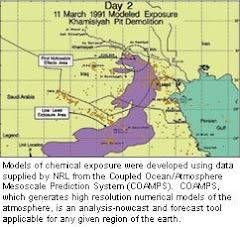 According to DeHahn's letters from the Office of the Secretary of Defense, the nerve agents sarin and cyclosarin may have been released into the air near DeHahn during U.S. demolitions of Iraqi weapons. The letters say the nerve agents would have been released in low levels causing no immediate symptoms but that long-term symptoms, though unlikely, are still unknown. DeHahn said the letters "scared the bejesus" out of him but that they also brought answers to why he had been feeling out of sorts since returning home, suffering from slight paranoia and sleep disturbances. "I was wondering what happened to me," he said, remembering bizarre situations where he believed his phones were tapped and that there was photo surveillance going on in his apartment. The paranoia has since subsided but DeHahn's trouble sleeping remains. DeHahn has been diagnosed with Persian Gulf Syndrome, the name given to a condition where two or more chronic symptoms become evident in a Persian Gulf War veteran. The syndrome led to DeHahn retiring on disability from the Army, which, through a Veterans Affairs hospital, is helping him to improve. "We're working on it," he said, sounding optimistic despite the fact that a monthslong battle abroad caused a yearslong battle for him at home. Yep my friend I am the same way. It seems that at night when it is Calm I am very alert but during the day I can relax a little better when it comes to sleep. Guess at night while we were there was when we were faced with the enemy but at day we took cover. Never will know the answer but I yearn still yet for this day for a good night of sleep... When the sleep finally sets in then the nightmares of war. Just Praise GOD we can function in super alert mode all the time it makes our senses higher.